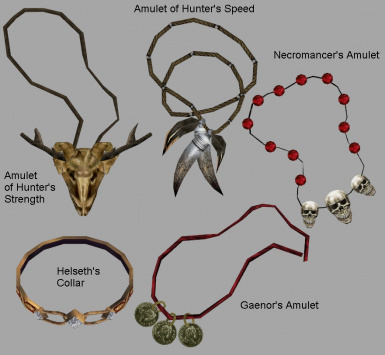 Gives most special and unique amulets, belts, rings, robes, shoes, and amulets new, unique models. You can do whatever you want with this mod but all I ask in return is that you give me credit if you distribute any part of this mod. Also, credit the mesh-makers (where applicable). Here's the details of the authors whose meshes I used, and the name of the mesh (my name for it) that they created. If you have any questions, feel free to contact me; as of the creation of this mod, I'm on the forums all the time. You can also contact me through Planet Elder Scroll's contact system, which will send me an email. Meshes: amulet_domination.nif, amulet_maran.nif, amulet_levitation.nif, amulet_divine.nif, amulet_sanit-kil.nif, amulet_shadows.nif, amulet_unity.nif, amulet_zenithar.nif, ring_akatosh.nif, ring_barilzar.nif, ring_equity.nif, ring_mezalf.nif, ring_marara.nif, ring_septim.nif, ring_sanguine_[instert name here! 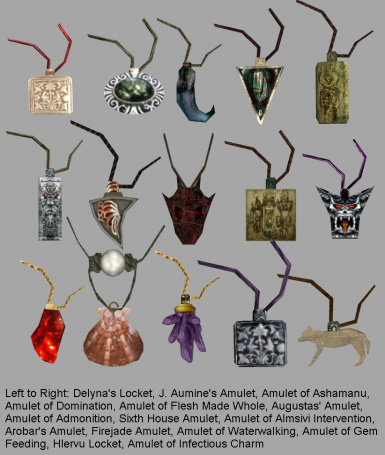 ].nif, amulet_waterwalk.nif, and possibly many other other meshes in this mod, since a frankensteined some of Daduke's meshes into Bethesda meshes (and vice versa). I think I've got everyone, but, having worked on this update for over a year, I didn't always properly keep track of who helped with what. If you remember helping me with the mod and don't see your name here, please contact me so that I can give you credit. Thanks for making these and letting me (and modders in general) use these beautiful meshes. Vince, I couldn't determine from your website and readme if you required modders to ask for permission to use your mod. If you don't want me to use your textures, please contact me. Thanks to Dirnae for the wonderful soldier belt meshes. Thanks to Narfblat and Trey Leavens for making a script template for me. 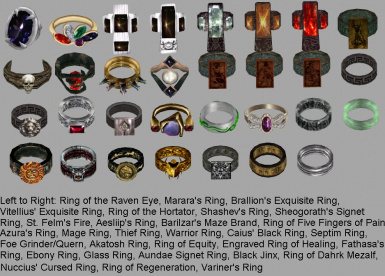 Thanks to Arcimaestro Anteres for the 6th House Amulet, Aesliip's Ring, Skink's Amulet, Ring of Equity, Fathasa's Ring, Ring of Engraved Healing, Ring of Raven Eye, Marara's Ring, and the animation on Barilzar's Mazed Brand. Thanks to R.D. for the helpful bug report for the Azura Ring mesh. Thanks to HammerUA on PES for the helpful bug report about too-long file names. Thanks to the folks on the Bethesda forums for their support, assistance, and feedback. You guys and gals are great! Thanks to the people who make Nifskope. 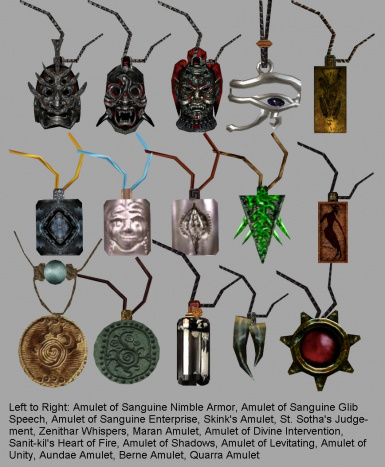 Gives most special and unique amulets, belts, rings, robes, shoes, and amulets new, unique models. All textures are actually vanilla textures, so they will look even better (hopefully!) with any texture replacers you use. New icons have been made, too. !!! THIS MOD WILL NOT MAKE AMULETS, RINGS, AND BELTS APPEAR ON YOUR CHARACTER WHEN EQUIPPED! This mod just gives them new ground meshes, so they'll look pretty on your shelf. The new icons will also make them handy to spot in your inventory. !!! - replicates MPP changes to items that my .esp alters, so that you can get the same fixes. 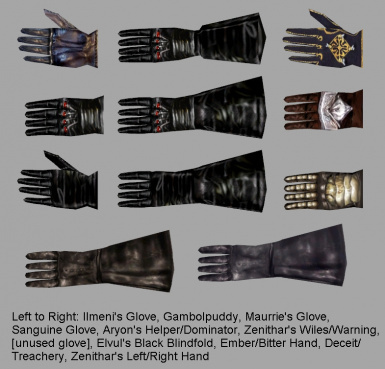 - edited Gloves will have right and left icons, as well as left and right ground meshes (if applicable). - Try using Yacoby's Close Inspection mod ( http://planetelderscrolls.gamespy.com/View.php?view=Mods.Detail&id=6879 ) to be able to see all the lovely detail on those itsy bitsy rings. >>>>DON'T FORGET: Back up any meshes in your Meshes\c folder that have the same file name as those listed in this readme's "Uninstall" section. Just add ".bak" to the file name to create an inactive BAK file. For example: "c_ring.nif" -> "c_ring.nif.bak". If you want to revert, delete my file, then rename the old file such that "c_ring.nif.bak" -> "c_ring.nif"
*I might have missed a few things, it's not easy keeping track of stuff I've worked with on-and-off for over a year. - "Ring of the Rive Fingers of Pai" -> "The Five Fingers of Pain"
- "Embroidered Belt" -> "Peakstar's Belt"
WHICH ESP TO USE: READ THIS! !!!! DO NOT RUN MORE THAN ONE UFR.esp AT THE SAME TIME! !!!! 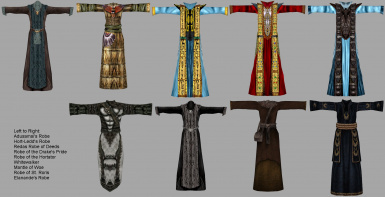 + UFRv3dot2 = model replacements, including robes. + UFRv3dot2_noRobe = model replacments, but not for robes. 4. Start the Morrowind Launcher, click 'Data Files', place a checkmark beside the .esp of your choice. - If you are running my Soldiers Belt Fix mod, you can deactivate and uninstall it. !!!! DO NOT RUN MORE THAN ONE UFR.esp AT THE SAME TIME! !!!! You can delete/remove any .esps you aren't going to use. Uncheck the .esp. Then delete it! Delete the other ones, too, if you haven't done so already. !! !NOTE: "[insert name here]" means just that.I didn't feel like typing them all out. Besides, did you really want to read two pages of mesh names?! I might have missed something in this list. To be absolutely sure you get everything, look at the .zip for this mod so you can see which items you need to remove. 1. Uninstall the old mod. 2. Install the new mod. 3. Start Morrowind and play. There should be no effect on saved games and should not corrupt any saves. 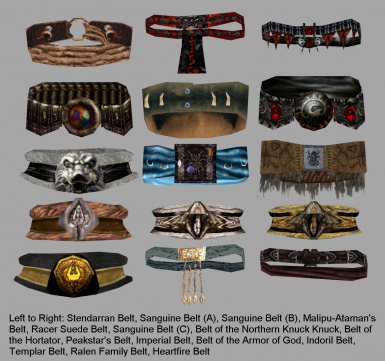 This mod will conflict with another mod that edits the Indoril, Imperial, and Templar belts. Versions of the MPP higher than version 1.6.4 should include the fix for these mods. Honestly, it doesn't matter if this mod overwrites that, as they make the same changes. If you are running my Soldiers Belt Fix mod, you can deactivate and uninstall it, as this mod includes that mod. This mod will conflict with all other mods that edit the items listed in the Big List of Changes earlier in this readme. CANADIAN ICE'S ROBE REPLACER MOD: will conflict with my robe edits. Use the "no robe" .esp included in this mod. D.I.Y. FIXES: You can selectively remove my edits with the Enchanted Editor (download my UFR_MEE_Tutorialv1.zip tutorial). WARNING: If you aren't running the Morrowind Code Patch, strange things might happen to you if you enable this mod with any of the modded items equipped on your character. ENCHANTMENT GLOW: Peakstar's Belt and the Ralen Family Belt will look odd when you see the plastic-wrap-enchantment; this is because parts of the mesh allow for transparent textures, but the glow-wrap will still outline the mesh, even if it is supposed to be "transparent." Try using a "no-glow" mod or a mod that changes or reduces the plastic-wrap effect. Or ignore the issue. 3.2, 2011/3/27 - clarification: none of the .esps will make changes to enchantments. I have removed this erroneous statement from the mod description, but it is still in the readme: just ignore it. 3.2, 2011/3/26 - bugfixes for icons and meshes. Thanks to "Leave Fargoth Alone! I'm Serious!" for pointing some of those out. 3.1, 2011/3/16 - fixed file name problems (thanks HammerUA). Removed Peakstar's Pants from both .esps due to user demand for BC-conflict-free UFR. 3.0, 2011/3/11 - I made it better! 2.0, 2011/2/19 - update and additions! Woot! 1.1, 2009/8/17 - fixed mesh problem with c_ring_azura.nif (Thanks swrdphantom!). 1.0, 2009/7/11 - Initial release.